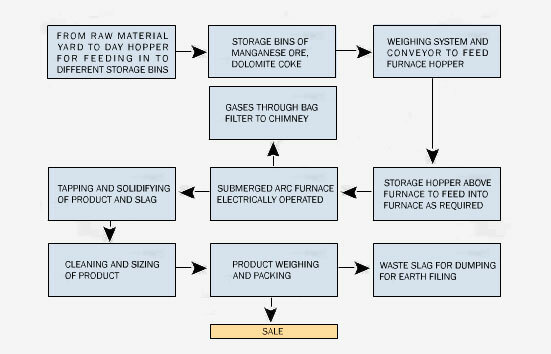 The basic raw materials for manufacturing of final products are Manganese Ore. The extraction of manganese takes place with the help of coke/coal. Dolomite and limestone technically known as flux are used in the process of manufacturing of fluidize the slag. The above stated materials are taken in the furnace by batch-weighing system as per calculation for manufacturing a particular type of finished goods of desired specifications. For melting of material, electric power is required. Transmission of electricity is made from sub-station to transformer. Transformer is connected to the casing electrode with the copper bus bars and copper flexible cables and contact clamps. Hence transmission of power from Transformer to casing electrode which is poked in the charged furnace, is made through copper bus bars and contact clamps. There after reaction takes place in the chamber of the shell. After melting, liquids alloys are withheld in the chamber and it is taken out in a molten mass condition from the chamber through the tape-holes. Tape- holes are opened with the help of flow of Oxygen through the lancing pipe which are consumed in the process. Liquid alloys and slag coming out as a molten mass are separated with the help of Laddle and skimmer. 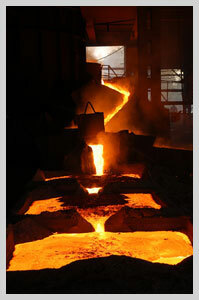 After cooling of metal and slag cake both are lifted from the furnace bed area to their specified area. Metal cake are broken, chipped / dressed and screened of a desired size and packed in the required packing material.